China's first telescope tasked with searching for signs of the elusive dark matter formally began its quest Thursday when it sent home its first set of observation data. The Dark Matter Particle Explorer (DAMPE) Satellite, launched exactly a week earlier, ran a power-on test before uploading its first count of high-energy electrons and cosmic rays at around 6 p.m. to the National Space Science Center under the Chinese Academy of Sciences in the Beijing suburb of Huairou. Everything seems perfect now... 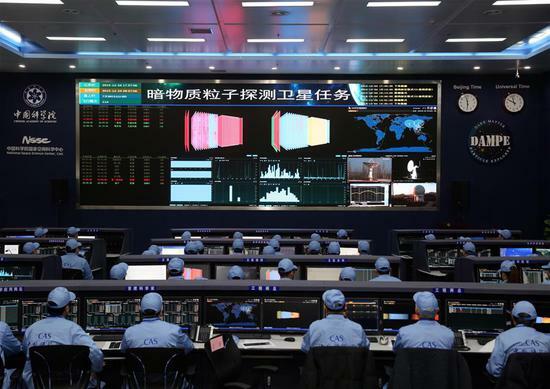 The pointing accuracy and the stability of the craft are actually several times higher than we anticipated when designing the satellite," said Chang Jin, chief scientist on the project. He said data sent back by DAMPE was in line with experts' initial calculations, suggesting the space telescope is functioning properly, adding that the satellite will still need to undergo two months of tests and calibrations. Nicknamed "Wukong" after the Monkey King from a 16th century Chinese classic, DAMPE was launched into sun-synchronous orbit 500 kilometers above the earth's surface last week from Jiuquan Satellite Launch Center. It has already circled the Earth more than 100 times. Scientists hope it can help lift the "invisible cloak" from dark matter and shed light on the material that is said to constitute most of the mass in the universe. Dark matter, which does not emit or reflect enough electromagnetic radiation to be observed directly, is one of the huge mysteries of modern science. Theorized by scientists unable to understand the missing mass and strangely bent light in faraway galaxies, dark matter has become widely accepted in the physics community, even though its existence has never been concretely proven. Scientists now believe that only around five percent of the total mass-energy of the known universe is made up of ordinary matter, while dark matter and dark energy make up the rest. Exploration of dark matter could give scientists a clearer idea about the past and future of galaxies and the universe, and would be revolutionary for the world of physics and space science. Wukong is designed to undertake a three-year space mission, but scientists hope it can last five years. Wukong will scan space nonstop in all directions in the first two years and then focus on areas where dark matter is most likely to be observed afterward. Earlier reports said Wukong has the widest observation spectrum and highest energy resolution of any dark matter probe in the world. According to Chang Jin, about 100 high-energy particles can be captured by Wukong each second while in space. Scientists will look for high-energy electrons and gamma rays among them, which could be residuals of dark matter's annihilation or decay.